The purpose of this book is to provide an overview of the Critical Chain project management solution. I've used Eliyahu Goldratt's book, Critical Chain, as a framework to help you understand the main components of the solution. Therefore, this book attempts to be a faithful synopsis of his book. While the synopsis of the Critical Chain chapters in his book are limited to the concepts expressed in Goldratt's original text, I added my own observations and interpretations to enhance your understanding. 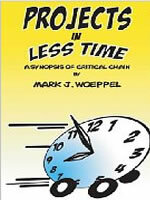 Projects in less time provides an introduction to the ideas introduced by Critical Chain in an easy-to-digest form and then round it out with glossary terms, and reference materials. According to many project management professionals, Goldratt's Critical Chain is "required reading". It's thought to be the most significant contribution to project management since the introduction of PERT system and the critical path method. How to manage the project? Start early or as late as possible? What if the project is cost plus? What if the bottleneck moves?